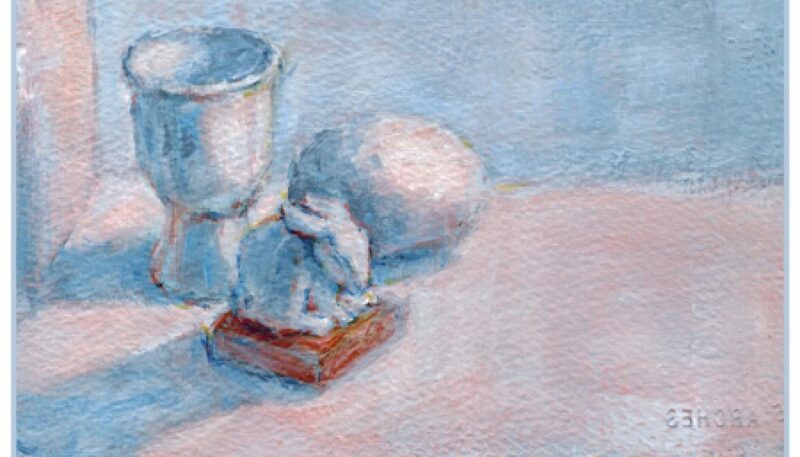 A fellow artist, Sandra Neary, asked me about the meaning of this still life composition. 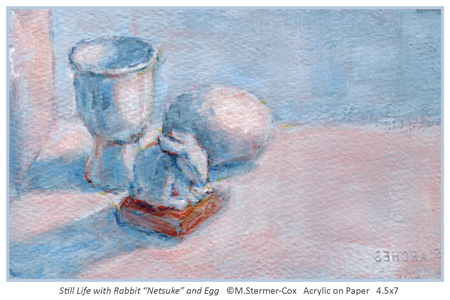 In particular, why is the egg larger than the rabbit? Dinosaur Egg & Pygmy Rabbit? Well, all sorts of silly responses bounced around my head. For instance, what if the egg were a dinosaur egg and the rabbit was a pygmy rabbit? All birds are dinosaurs so it could be true. 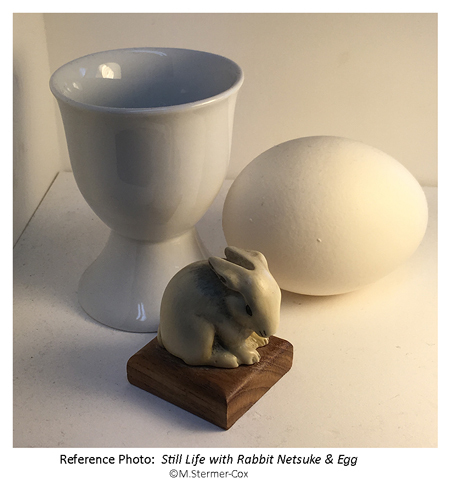 Alright; it is a chicken egg and a replica of a rabbit netsuke. However, the question was put forward. And, I thought I’d quote part of the answer I gave. However, I did start thinking about the meaning of this composition and, perhaps two dimensional art in general. And, I came to the conclusion that it is reasonable to ask about the meaning of a painting or drawing. After all, the arts, including the visual arts, are a means of communication. Therefore, it would be natural to want to understand a piece of art. How I Select Items For This Still Life. 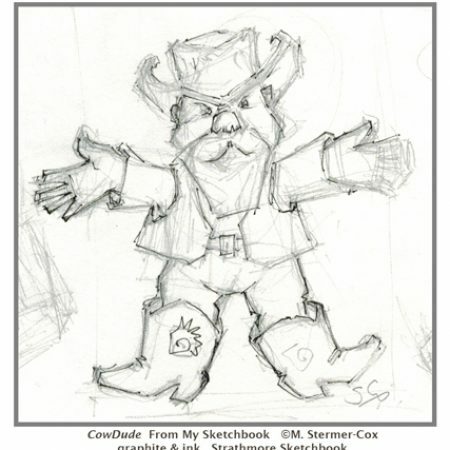 That being said, this artist, (ahem, yes, I mean me), is prone to selecting subjects for reasons other than symbolic or iconic meaning. Shape and Value. 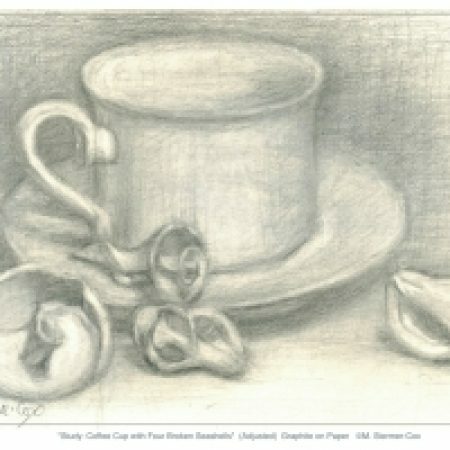 For example, when I selected items for this particular still life set up, I chose them for their shapes and tonal value. 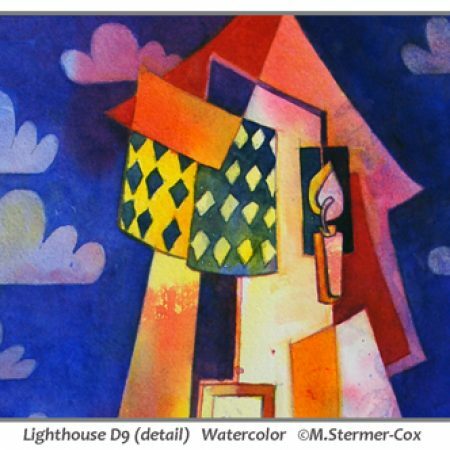 To explain, I was interested in studying form free from the distracting influence of color. So, I selected the items because they were a neutral, light or white color. Geometry. Furthermore, I was interested in the basic geometric shapes depicted here. 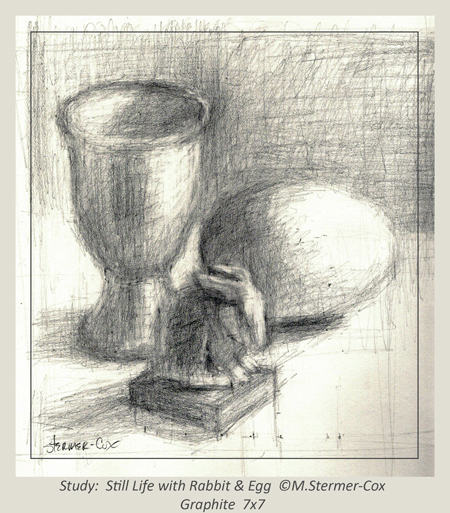 The egg cup, for example, is a modified column. The egg is like an elongated sphere. The rabbit has similar rounded forms. Personal Interest. And, I liked each of the items. They’re from my personal collection of knick-knacks. So, once I selected the items for my still life study, I had to arrange them. Keeping in mind composition, I set about placing my knick-knacks. You will notice that clustered the three together in a sort of triangular shape. It is like they are in huddle over to the left. By clustering the items to the left, I set up a problem of how to balance the right side. My response was to see if line and small shifts in tone will be enough to achieve balance. 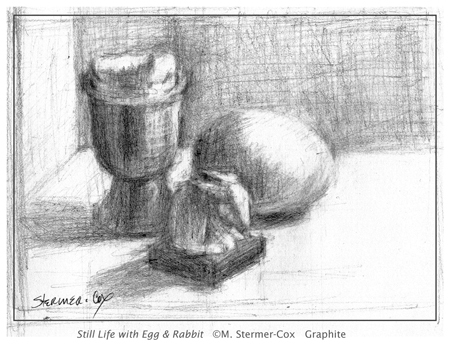 I am including a photo of the still life set up so that you may get an idea of what I was studying. However, I drew and painted from the life; not the photo. Hmmm, you might think, this all sounds academic. Well, I think it is at this stage of the process. That is to say, I am purposeful in my set up; not spontaneous. In other words, I’m experimenting and teaching myself by doing. I take the rules and principles of composition, apply them and then see what happens. The process is like an informed trial and error. Learn By Studying & Doing. You see, one reads the books, studies the demos, and takes the workshops, in an effort to learn how to draw and paint. But, along the way, one needs to do the work. So, I start with the principles and then go about the process of learning how to use them. That is, I need to try out ideas using pencil or brush on paper. At such times, I feel compelled to ask the “what if” questions and see what happens. In other words, I’m studying the art of drawing and painting by doing. The Concept of “Meaning” Deserves More Study. So, let us go back to this idea of meaning in drawing and painting. As I am writing and considering this question, I realize that meaning might need to be studied just as form, value or color. So, with that, I think I will close with the thought that this ought to be the beginning of a series of articles about meaning in paintings. And, a final word about this particular still life. Could it mean more than my intentions? Well, as the viewer or receiver of the visual message, you bring your own experience to the conversation. So, yes, it could mean something entirely different to you. And, that is just fine with me! PS. Note with the variation below, I changed a couple of things. Does meaning change as well? What do you think? Thoughtful article. I enjoyed it and look forward to more. Hi Laura! Thank you so much for stopping by and leaving a comment. I’m glad you enjoyed the article. Its surprising to find out that the subject of “meaning” can be so interesting and enlightening. I hope to do the subject justice.